Releasing a new pattern can be a scary proposition. We ask ourselves if we’ve made the instructions clear, are the instructions right, is the math right, will my target audience find the pattern easy to use? Let me help you get over that scary feeling to release your new pattern with confidence. 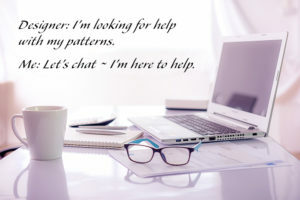 Combining my extensive & diverse background in knitting, crochet, design and accounting, I will provide you with the high level of knit or crochet tech editing services every designer deserves. I have also completed the Knitgrrl and Joeli Creates tech editing courses to compliment my corporate background. I welcome all designers, and am accepting new clients for knit or crochet designs. checking math, sizing & grading for errors and/or inconsistencies. checking stitch counts, including stitch pattern multiples, are correct. ensure schematics, gauge, and written instructions match. ensure charts and written instructions match, and work. make sure the pattern is complete and not missing important information. make sure the pattern consistent with your style sheet. check consistency of capitalization, fractions/decimals, abbreviations, etc. 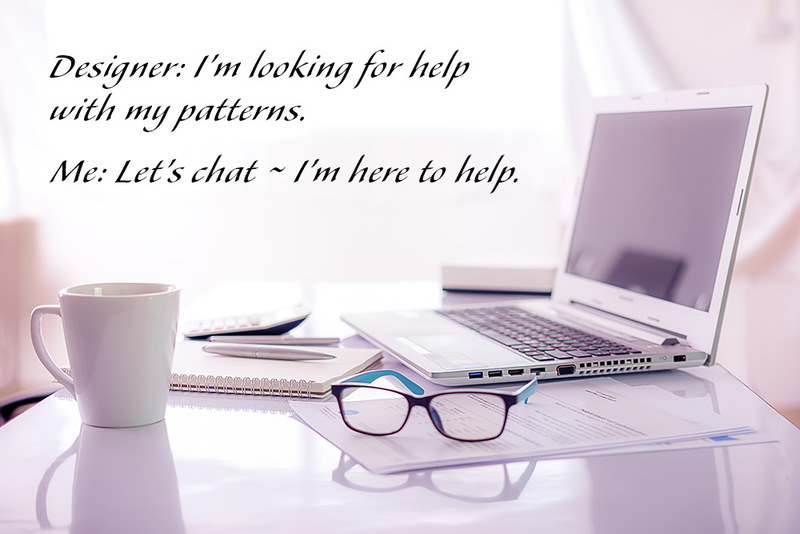 check the copy for grammar, punctuation, typos and consistency throughout your pattern. verify the pattern will produce the item as shown in the photographs. suggest changes for copy, layout, formatting or style when appropriate, that will make your pattern easy to follow. create charts from written instructions, and vice versa. create vector schematics based on finished measurements. help you develop a style sheet. Additional Services are billed at $30/hr, in 15 minute increments. Please contact me for a quote on Additional Services. I work with PDF, Word or RTF files, Pages via iCloud, along with Excel, Stitchmastery, Photoshop and Dropbox if you prefer not to email your files. My specialties are garments, accessories such as shawls, scarves, cowls, socks, mitts, and home decor. I am not editing amigurumi or toys at this time but am happy to refer you to another editor. Typical turnaround time is approximately 1 week for the initial review, and 48 hrs for the second review, from when I receive your pattern. I invoice only after the editing is completed and we are both satisfied with the final pattern. I currently accept payment by Paypal in USD. As both a tech editor and designer, I understand how important it is for your pattern to be error free and easy to follow. I want you to be happy with your final pattern, and guarantee my work. If any errors are discovered in my work, I will re-review the pattern and any required errata as part of my initial fee. The first step is to fill out the form on my Contact page with “Tech Editing” in the subject line, and I will reply to you within one or two business days. I look forward to working with you!